I don't think any new material that DC comics has released in the last three years has excited me as much as this Young Animal ashcan I picked up at my local comic book shop last month. This eight-page sampler gives us a glimpse of the new DC 'for mature readers' imprint that Gerard Way will be ringleading. Wrap-around cover of DC's Young Animal ashcan (2016). 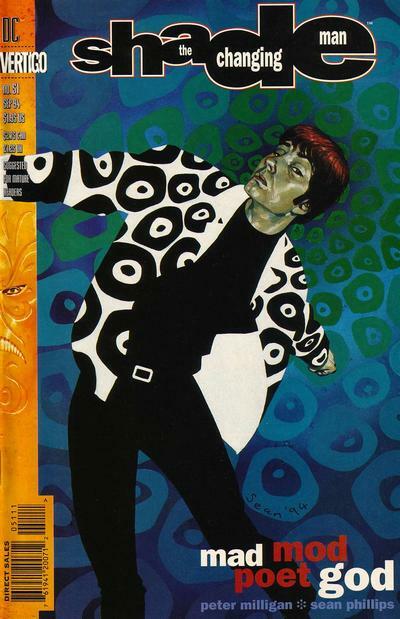 Cover by Paul Rentier. 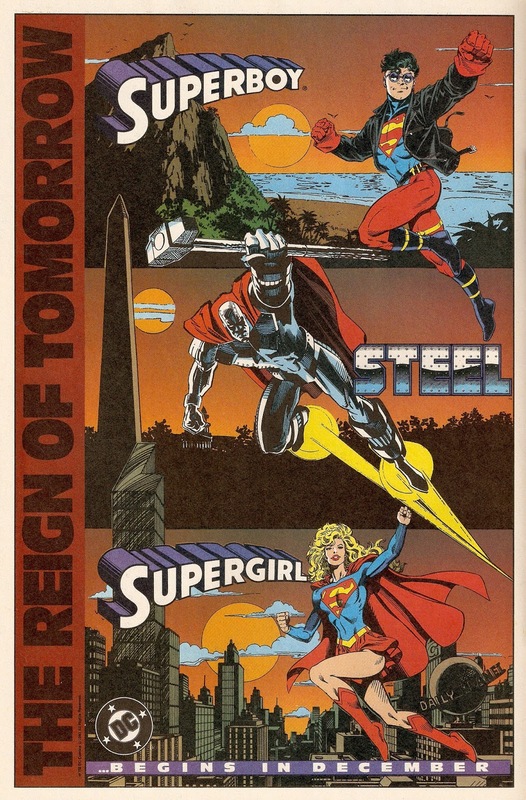 Moving past my love for DC's Who Who series, the cover art has a very nice 'early 90s pre-Vertigo' feel to it. Bonus that it's in black & white. Bonus that there's random fonts in different typefaces floating around — like someone really messed up at the printing press and decided 'nah, let's distribute it anyways'. 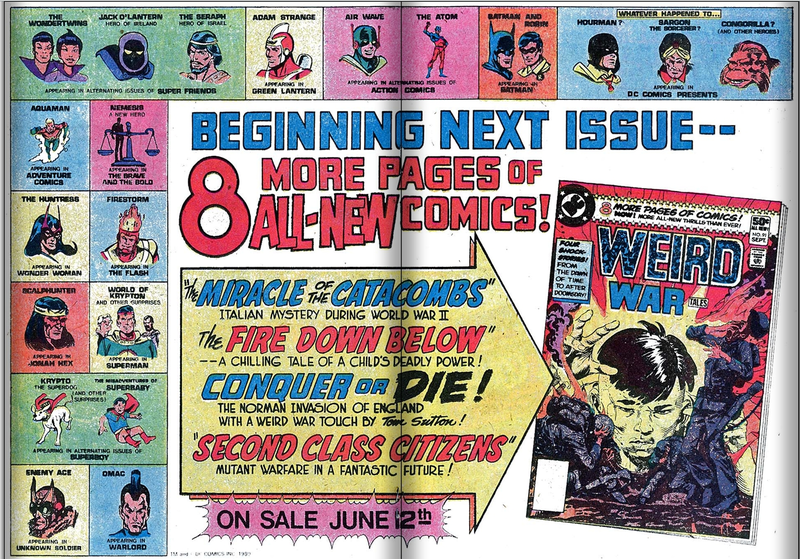 The bizarre array of characters on the cover remind me of the excitement of reading early Vertigo comics. "New characters! Who are they? How do they relate to current or legacy DC characters? Tell me more! ", or even the feeling of counter-culture rebelliousness I felt I projected as I thumbed through my copy of Dark Horse's Tank Girl. Hey, I was right! 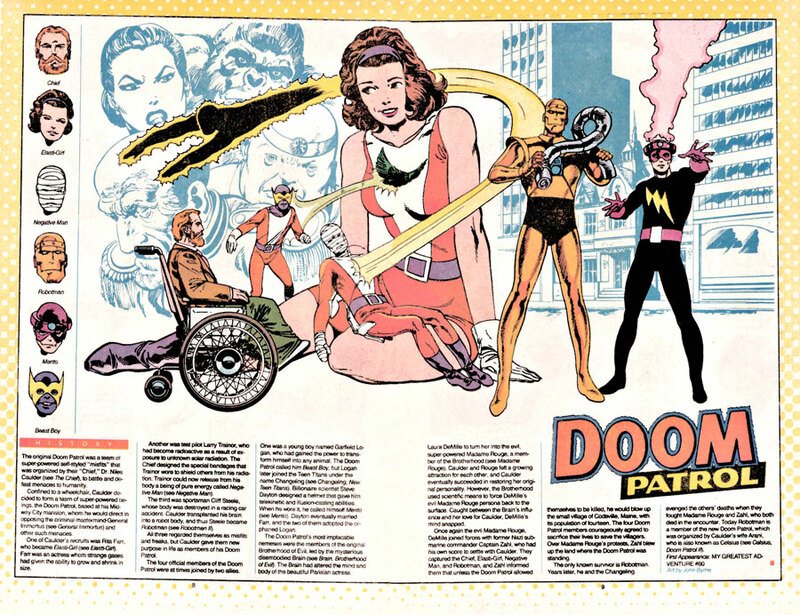 Doom Patrol illustrated by John Byrne. Moving beyond the cover, which seems to speak more than a thousand words, the interior cover page treats us to a message from Gerard Way with an accompanying photo, followed by a few full-page Who's Who entries and a few pages from the flagship titles that will be launching this imprint. The whole package concludes with a page of head shots of the creative teams working on this imprint, and an interior back page cover with teasers of what the covers of the 1st issues will look like. The Who's Who entries introduce us to a few new characters (and re-introduces us to one revamped oldie). 'Shade, The Changing Girl' is making me want to dig out my Peter Milligan Shade, the Changing Man Vertigo issues from 1990. 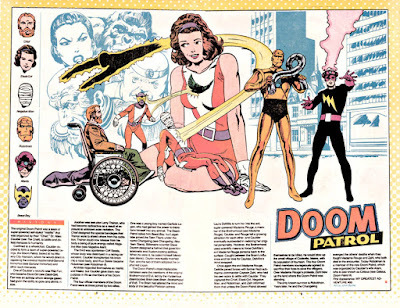 'Space Case', a new Doom Patrol member, looks suspiciously like she was illustrated by Mike Allred. 'Mother Panic' is an interesting character, if only for the Bat insignia floating in the background of her bio pic and the implication that she's a bisexual. Cave Carson seems to be the legacy hero they plucked out of obscurity to be revamped for a new audience (while still respecting his roots) via a new cybernetic eye. So far, all four of these titles have my interest — with Shade, The Changing Girl and the Doom Patrol leading the pack. Brave and the Bold #41 (1962). A Cave Carson adventure. There are a few black and white preview pages from each of the four new books, but there's no dialogue — so that doesn't really tell me much. The art is clean and uncluttered, except for the Mother Panic excerpt, which appears to be a 2 page ink-wash drawing. This all looks very good so far. I'm reviewing the last page's Young Animal Creative Team roster, and there's not one name I recognize. Oh wait,... there's Todd Klein, He's lettering Doom Patrol. This ashcan makes a strong first impression. If this webzine were ever to be published as a print 'zine, this is how I'd want it to look. 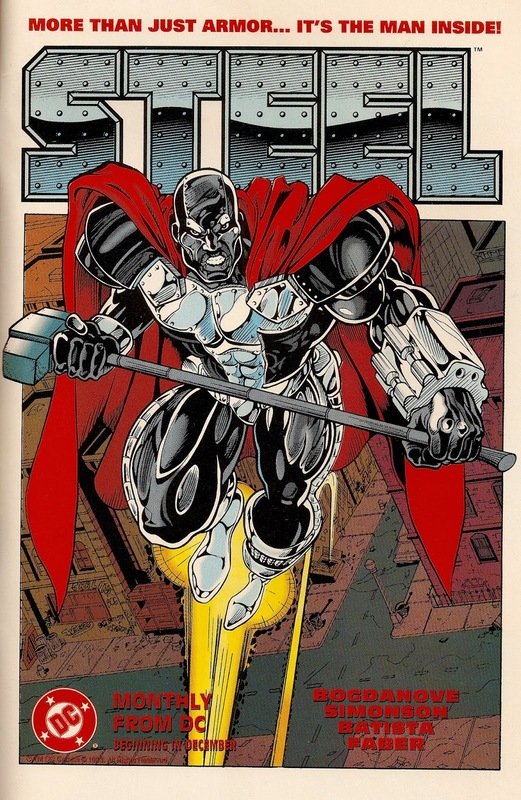 Publishing a new imprint with a cast of relative unknowns could be viewed as a risky proposition, but IF they can tap into the creative energy that fueled the late 80s/early 90s pre-Vertigo rush that led to the publication of so many great comics that we STILL talk about today, then we may have a winner here. This is definitely an imprint I recommend keeping a (non-cyberentic) eye on. When I discovered that Tom Grummett was appearing at the Montreal Comiccon, I felt like I had won the lottery. 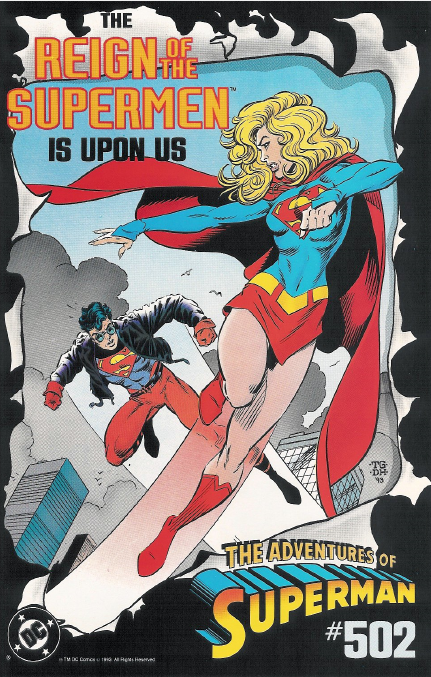 Not only was Grummett the Teen Titans penciller from the late 80s to the early 90s, but he had also worked on the Death and Return of Superman story line from the early 90s, and a spin-off title [Superboy] that I was avidly collecting at the time. Interviews with Tom Grummett are far and few on the internet (but we did find a few — see links below), so I felt incredibly lucky to sit with the man himself. I want to thank Mark Belkin (who is a more knowledgeable Teen Titans fan than I) for accompanying me in this interview and helping me drive the questions home when they may not have always been very clear. Phantasm. New Titans #73 (1990). 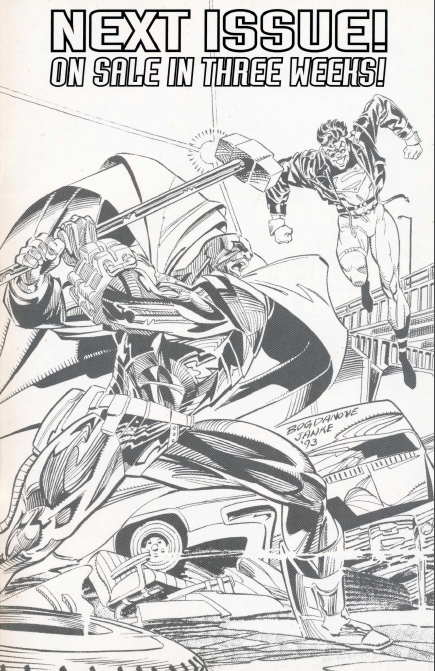 Pencilled by Tom Grummett and inked by Al Vey. Justin: You were also at 'the summit'. I remember talks about a big 'hush-hush' Teen Titans summit where the plan was to totally revamp Teen Titans. The idea was "we want to turn this into a really successful franchise book, so we need some ways to 'shake it up'". Mark: How did it lead from your starting out and then how did it lead to the summit? Grummett: I guess what kinda happened is, over time, the book became more and more popular with the fans. It's very difficult for a book that starts off with a huge fan base, and then has it's fan base sort of trickle away over time, to suddenly start getting a whole NEW fan base. It can happen, though. And I guess that's kinda what occurred. At the time, I guess the thinking editorially was "okay, we've got a lot of people buying New Titans, we should try and expand that and turn it into a franchise. Either we can maybe draw in more fans, or get fans who were already buying this one book to possibly buy two books". So I'm pretty sure that was what the impetus was: to kind of, for the first part, try launching the second title and then trying to further maintain that, and see if we could run a Superman-style or Batman-style franchise. Justin: Mike Carlin was editing The New Titans at the time, right? Grummett: Mike was the editor for the first two or three years that I was working on it. Now he may have been the official editor beyond that point, but the guy I tended to work with the most was Jonathan Peterson. When I first got on the book, he was the assistant editor. Mark: And so, with the Titans Hunt — the story arc where they were eliminating a lot of the Titans — were you part of the decision-making on who got altered? Such as Cyborg becoming less of a human, and some of the other deaths? How did that work editorially? Did you have a lot of input on that? 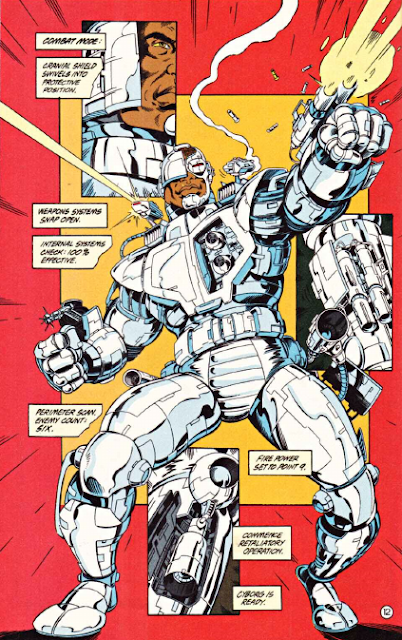 Cyborg the war machine. New Titans #78 (1991). Pencilled by Tom Grummett. Grummett: I don't believe that was actually the way it worked. 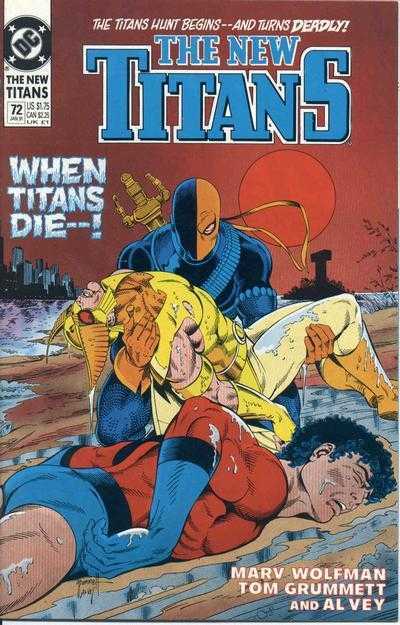 I think it was a conversation that Marv Wolfman had with either Jonathan [Peterson] or Mike [Carlin], and somebody blurted out the idea "well how about a story where someone is picking off the Titans one by one and no one knows who it is?" The New Titans v1 #72 (1991). 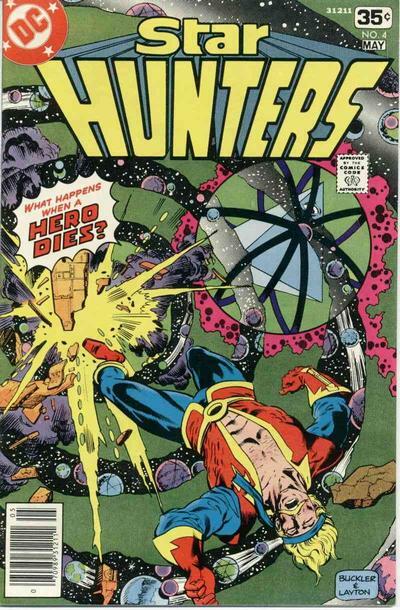 Cover by Grummett. Grummett: Yeah. So, it really got Marv fired up with this idea. At that time we would mostly work together via phone and we would talk over different ideas about how this would unfold. When you start with an idea that someone is slowly picking them off one-by-one and you don't know by who or anything like that. And then you start working out who's behind it. To be perfectly honest, right at the beginning we had no idea. Grummett: Not a clue. And as time went on, it kind of grew organically into the thing it finally became. There's lots of pros I've talked to who have said "That Titans Hunt story line... it was GREAT". Justin: I think Jericho really ended up drawing the short straw on that one. Why was that? Did you guys just not like him anymore, or...? Grummett: That totally came from Marv. Mark: He birthed him, and then he took him back. Grummett: Yeah, that kind of thing. Jericho. New Titans #79 (1991). Mark: How was it working with Marv, because he'd already been on Teen Titans since 1980 and he'd worked through Crisis On Infinite Earths and now it's 1989... was he already burned out on Titans? Did he still have energy going into it? How did that work towards 1989 working on the Titans? Grummett: I think Marv would be able to answer that better than I could. 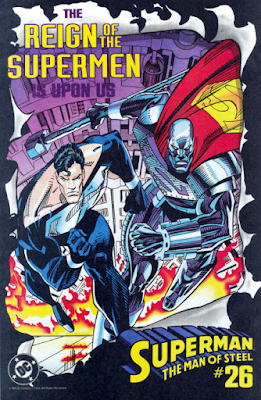 My experience with working with Marv was: George [Perez] had come back to the book for issue #50. This was a big deal. Work progressed for a few months that way until George got into a car accident. What with recovery and pain medication and who knows what (I don't even know), he felt that he was unable to continue on the book - but he would do layouts. So, the job was offered to me: working from George's layouts I would pencil the book. I worked that way through the Lonely Place of Dying story arc — where Tim Drake became Robin — so there was a cross-over with the Batman books at that point. I would get the layouts from George and the scripts from Marv, I would work away on these things. And then finally George decided to just leave the book entirely — hopefully because he felt it was in good hands. So he left ME behind with Marv. I'm a NEW guy and suddenly I'm working with Marv Wolfman and it's ALL me. Justin: Those are big shoes to fill. Grummett: Well exactly. It was a little intimidating in the beginning. Marv and I did a panel a few years back, and we were talking about that, I said "so here I am, slight case of flop sweat, working on this book with you — now all by myself — with no George Perez to hold me by my hand to guide me through it and I found Marv was very generous and he listened to my ideas" and he said "eh, you knew what you were doing". Justin: Were you getting to add input to story ideas? Justin: I'm curious what you specifically brought to the title? Grummett: This was so long ago... it was usually stuff would come up in the course of a story and I'd get the plot and I'd maybe get an idea of the way a scene should unfold, and I'd phone up Marv and he's say "sure! do it!". It'd be like that. Justin: Team Titans. You guys brought back Terra. Was it you that suggested bringing back Terra for Team Titans — or should I say "the clone of Terra"...? Terra II. 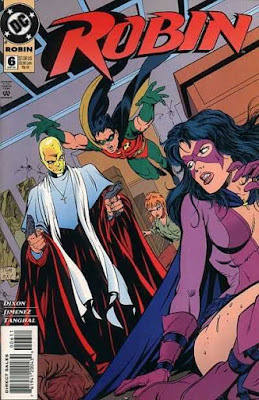 New Titans #86 (1992). 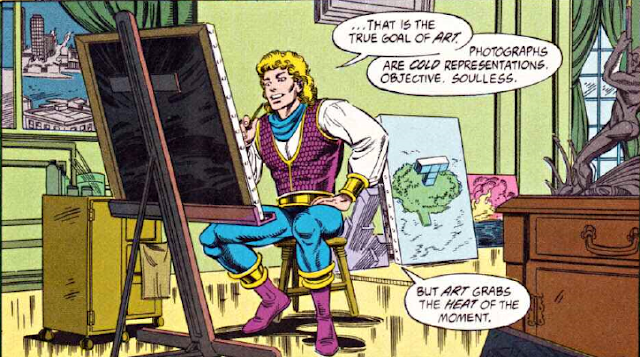 Pencilled by Tom Grummett. Justin: After The New Titans you did some work on the Superman books. Which was huge. 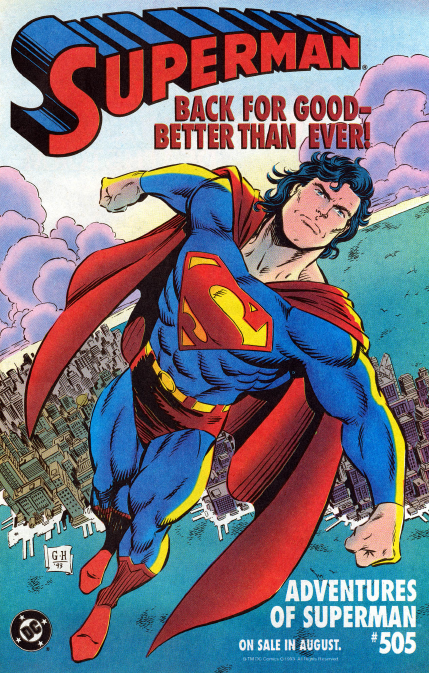 Although I grew up reading comic in the 80s (and this spilled over into the early 90s) one of the biggest events, for me, was The Death of Superman. I remember it being ALL OVER the media. Superman died, and that was all well and done, but then they had the four potential Supermen who could be replacing him. I knew for a fact it that neither Steel nor Superboy would be revealed as the replacement. I figured it was either the Eradicator or Cyborg Superman. I was positive DC was going to keep the Eradicator as the new Superman. That was the whole gimmick — 'which of these four is the REAL deal?' — not realizing that the original Superman would evidently return. You created Superboy. That was yours. You designed Superboy with a kind of 90s/Gen X/punk-type look... do you have memories of working on that character? Grummett: Oh yeah! Oh yeah! I remember that [Superman] Summit. The summit meeting where we had to come up with how we were bringing Superman back. There was no question that Superman was coming back. Grummett: Well, yeah. From the time we decided to do this Death of Superman story line, he was coming back. As far as we were concerned, EVERYONE in the industry knew it, and all the fans knew it. Poster from Adventures of Superman #501 (1993). 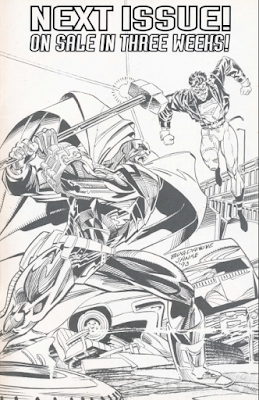 Pencilled by Tom Grummett, inked by Doug Hazlewood. Justin: My point is that it was a REALLY good hook. It re-invigorated my interest in DC comics (and the Superman franchise) by a hundredfold. Grummett: It was a tremendous hook. It was four people claiming to be Superman. It was like Elvis sightings. That's the way we looked at it. None of these guys were actually going to be [Superman], because they couldn't be. They couldn't be Superman because none of the WERE Superman. They had mysterious connections TO [Superman], but none of them were going to be able to take over his spot. At least that was our theory. Justin: Did you raise your hand to volunteer the Superboy idea? "I'd like Superboy to be one of the four contenders"
Grummett: Actually, in reality, it was Jon Bogdanove and [Jackson] Guice who threw out the name 'Superboy' and I responded with "Don't call me Superboy!". There was a little back-and-forth between us about who was actually going to do this Superboy character and they said "You know what? You guys do it. You seem to have some ideas for this one — really good ones — we've got some other ideas we'd like to play with" and they came up with Steel. Page from Adventures of Superman v1 #500 (1993). Pencilled by Tom Grummett and inked by Doug Hazlewood. Justin: When you were creating Superboy from scratch, did you have a model? Was it based on some actor/celebrity at the time? Grummett: Nope. I actually drew the original sketch of Superboy, fully-formed — the way he looked in the comic book — on an airline napkin on the flight home. As soon as I got off and back to my studio and was settled in again, I re-drew it with the jacket, without the jacket, front and back, faxed it in to Carlin and said "this is what I think he looks like". Mark: Was the success of Superboy then what led you to work on Robin? Is that editorial's decision of having one artist of a youthful superhero moving onto another youthful superhero or was there no connection at all? Grummett: Right. "He'll do Robin, too". I got to do both. 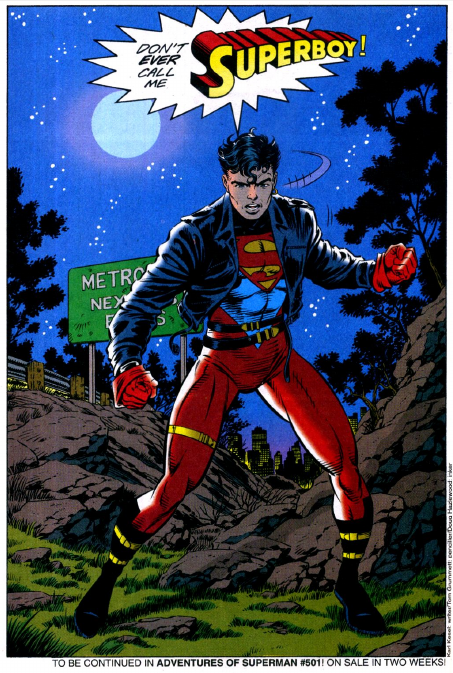 Justin: You did Superboy for a LONG time, from 1994 up to 2001. Grummett: Issues 1 to 26 before Karl [Kessel] and I went off the book, and then we came back on again with issue 50. [The reason for the hiatus was because] Karl had run out of ideas on what to do with Superboy but then came up with a bunch of new ideas and asked the editor, who said "sure! you can come back!". Justin: Thank you so much for taking the time to chat with us today, Mr Grummett. I had about a thousand more questions to ask about his work on Teen Titans, Superboy and Robin (and even a few Marvel comics projects he had work on afterwards), but Saturdays at comiccons are typically the busiest for artists and I didn't want to take him away too long from the rest of his fans. I'm just grateful we got this. Thanks again for your time, Mr Grummett. 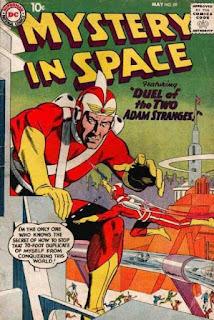 You may remember Adam Strange from all those cool Silver Age science-fiction/adventure comics during the late 50s to the early 70s (i.e., Showcase, Mystery In Space, and Strange Adventures). We won't be talking about those today. Instead, we'll be covering Adam Strange's appearances from 1978's Showcase all the way up to his appearances prior to L.E.G.I.O.N. '90. 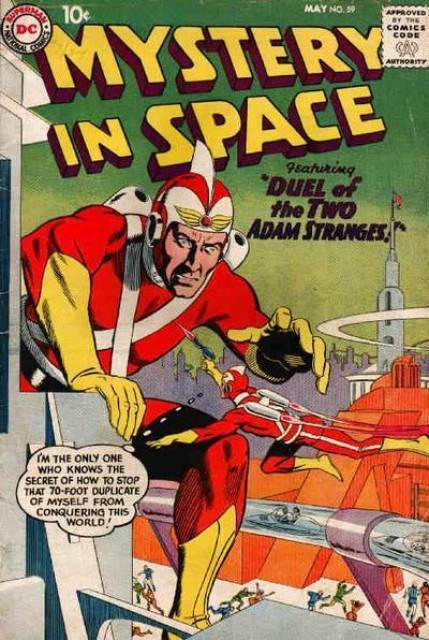 To the rest of us who really don't know who he is, Adam Strange was that guy with a jet pack and laser pistol who was usually found flying around battling some odd other-dimensional creature or menace. And for some reason he was very concerned with Zeta-Beams. There's actually a lot more to him than that. Showcase #100 (1978) was a 'jam issue' of sorts, celebrating it's centennial issue by featuring every DC character who "made Showcase famous". 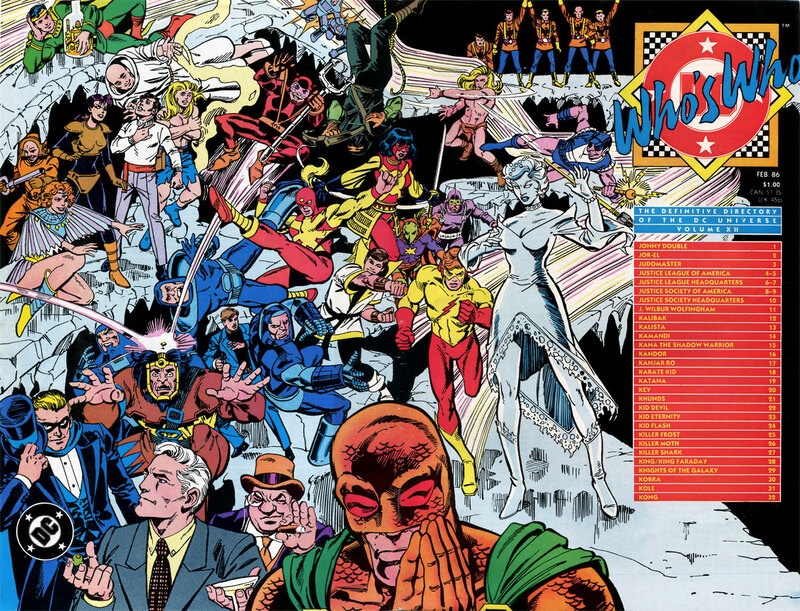 This included the Flash (Barry Allen), Green Lantern (Hal Jordan), Hawkman, the Atom, Rip Hunter, the Teen Titans, Hawk & Dove, Lois Lane, Space Ranger, Tommy Tomorrow, and countless others... even 'funny' characters like Sugar & Spike, Binky and the Inferior Five had appearances. Nothing really noteworthy about Adam Strange in this issue, except that he's hailed as "the best in the universe at Space-Fighting" (that honor is also shared with Green Lantern). He also gets a chance to drop a bit of science on us by explaining in visual detail how the Doppler Effect works - reminding us that Adam Strange is a 'scientific' hero who uses his wits and science know-how above all else to defeat his opponents. Adam Strange had appeared in Justice League of America a year ago, so it would be expected that he was still contemporary enough for readers to know who he was. It's not really considered canonical to the DCU, but was a "fun" issue nonetheless. 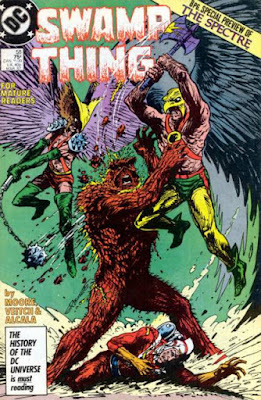 Immediately following his appearance in Showcase #100, Adam Strange teamed up with Hawkman and Hawkgirl in Showcase issues #101, #102 and #103. 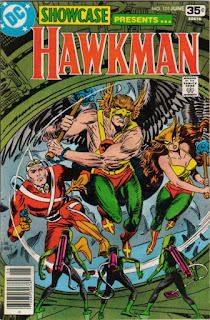 Written by Jack C Harris and illustrated by Al Milgrom (penciller) and Murphy Anderson (inker), Adam Strange joins forces with the Hawks to defend his adoptive world of Rann from an invasion of... Thanagarians? [Would that make this the first Rann vs Thanagar war?] It's revealed throughout the course of the story that the entire skirmish was orchestrated by two early 1960s Justice League of America villains who were feuding with each other and using the respective planets as pawns. 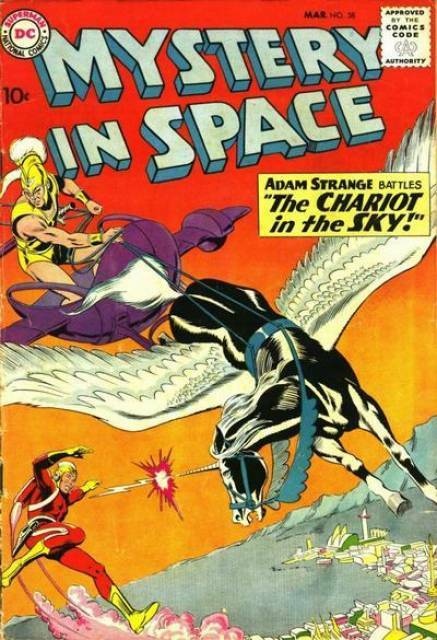 It's a bit of a throwback to DC's Silver Age, as I seem to recall Adam Strange and Hawkman teaming up a few times. 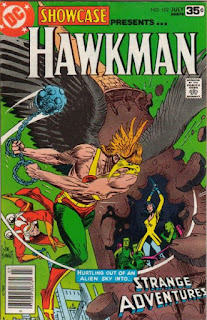 It's not the most fascinating read and kind of ends the way you'd expect it to, but this three issue story arc would play a BIG role in the Hawks continuity and would be repeatedly referenced in future Hawkman/Hawkgirl stories as the reason the Hawks had been banished from Thanagar as traitors (prior to this they were avoiding Thanagar due to the 'Equalization Plague'). 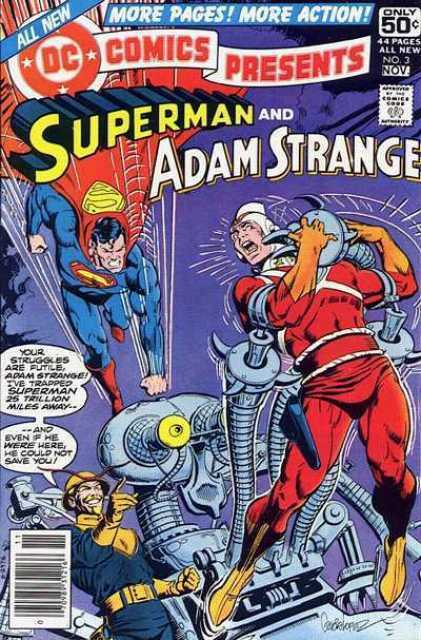 It also threw Rann into a massive civil war that would affect future Adam Strange stories. Of note, Showcase #104 was the last issue in the series. DC Comics Presents #3 (1978) was Adam Strange's next comic book appearance. 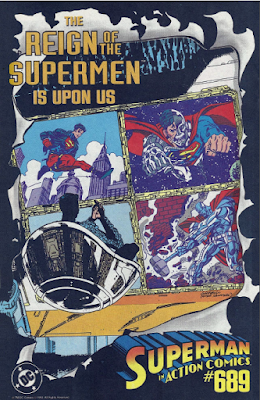 DC Comics Presents was essentially a 'Superman team-up' book and a lot of the allure was guessing which DC character Superman would be teaming up with next. This Superman/Adam Strange team-up follows the events of the Rann/Thanager War previously mentioned in Showcase, and re-introduces an old Adam Strange foe last seen in the early 60s. By now you've noticed that this is the third early 60s super-villain that DC has re-introducing to a late 70s audience in 1978. This issue was written by David Michelinie (with Jack C Harris in a consulting role) and illustrated by José Luis Garcia Lopez. Brave and the Bold #161 (1980) was a quick yarn about Batman and Adam Strange switching places to solve each other's case. Similar in concept to DC Comics Presents, Brave and the Bold was a 'team-up' title that had Batman teaming up with someone new every month. 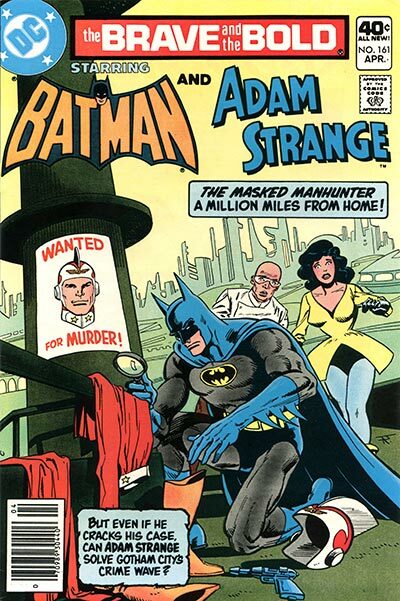 Gerry Conway wrote this one, and Jim Aparo illustrated. This issue includes a quick origin recap telling us how Adam became the champion of Rann - with no mention of the Rann/Thanagar War that had happened two years prior. I'm not a 'continuity hound' by any means, but other readers picked up on these details too. Brave and the Bold #161 hit the newsstands around the same time as World's Finest #262, which also contained a Hawkman/Hawkgirl story featuring Adam Strange. In this sci-fi/mystery tale, written by J.M. 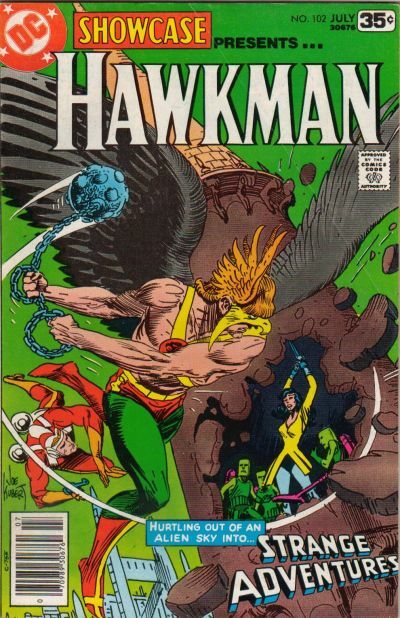 DeMatteis and edited by Jack C Harris, the Hawks have a very clear memory of the Rann/Thanagar War from Showcase and even reference the aforementioned BatB issue. The Hawkman/Hawkgirl story ends with a lead in to Adam Strange's solo-story as featured in World's Finest #263. World's Finest #263 (1980) credits Schwartz and Fox as the creators of Adam Strange. Adam Strange appears again in the World's Finest #264 Hawkman/Hawkgirl story (which picks up where World's Finest #262 left off), but it's just to say good-bye to Hawkman. As part of DC's 1980 commitment to bring you 'more pages for your money', an Adam Strange back-up feature would start in Green Lantern v2 later that month and run until December 1981. Just look at all the cool back-up features that started appearing in DC titles. All this for a 10 cent price increase per book! Jack C Harris was editing Green Lantern v2 when Adam Strange started being featured as a back-up. [Are you noticing a pattern here?] Thankfully, Green Lantern had been leaning more towards 'cosmic' tales (first with the inclusion of the Green Lantern Corps back-up stories and then with more space adventures), so Adam Strange fit right 'in theme'. 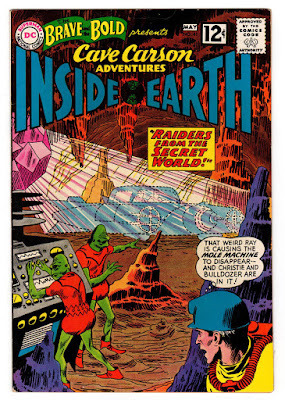 The first eleven issues of these back-ups (which were written by Laurie Sutton and edited by Jack C Harris) quickly resolved the Rann Civil War story line [which had been brewing since World's Finest #263] and now allowed Adam Strange to revisit earth. Len Wein edited a back-up story after Harris left as editor, and Dave Manak picked up editing chores after Wein until the end of Adam's back-ups in Green Lantern v2 #147 (1981). The majority of the 8 page stories were illustrated by Rodin Rodriguez (with inks by Tex Blaisdell, Vince Colletta, Dennis Jensen, Pablo Marcos or Larry Mahlstedt) and Carmine Infantino pencilled a few (with Murphy Anderson inking at least one). The Green Lantern v2 Adam Strange back-up tales were self-contained stories that primarily focused on Adam Strange, his core supporting cast and the planet of Rann (so no appearances by Hawkman nor the rest of the Justice League). The stories didn't really do anything drastic with the character and were nice little throw-backs to the Silver Age of DC comics. While they were good, there was some crazy stuff happening in Green Lantern v2 at the time - Marv Wolfman was writing for the title and re-introducing a lot of sci-fi elements to the series (ex: Silver Age sci-fi characters Space Ranger and Cryll were making guest appearances, the Gordanians were introduced, the Omega Men made their debut) - and I don't see why Adam Strange didn't get tied into this, especially with Wolfman's efforts to show a sense of cohesion within the DCU. 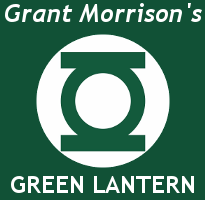 In the letter column for Green Lantern v2 #137 (1981), Harris confirms that these first few back-up stories were originally written by him and meant for another title [my guess would be 1978's Star Hunters], were shelved, and later revived and scripted by Sutton to be published in Green Lantern v2. I can't confirm this, but I suspect all the 1980 '8 page back-up features' were originally casualties of the 1978 DC Implosion and just recycled to appear in other titles. Harris is a pretty cool cat, and we managed to catch up with him and chat about his work on Adam Strange. Due to a tepid response from readers, the Adam Strange back-up features were bumped for the more interesting Green Lantern Corps back-ups that had previously been running in Green Lantern v2. (It was hinted that Mike W Barr had some really interesting ideas for Adam Strange stories and wanted to take over the character.) Fandom just wasn't ready for an Adam Strange revival, yet. Coincidentally, it was reported that sales for Green Lantern v2 dipped pretty badly after the Space Ranger story [#136 - #137], and started climbing again after the Omega Men were introduced [#141]. I wasn't sure if I should include Justice League of America v1 #200  as an Adam Strange appearance. Yes, Adam does appear, but only on two pages as a deux ex machina. (Don't get me wrong, Justice League #200 is a fantastic book and should be checked out for it's own merits - especially the all-star cast of talent illustrating the anniversary issue). The issue contains a quick mention about the Rann/Thanagar War from Showcase - so it's nice to see that they're still keeping up with that continuity. It's also suggested that Adam and Hawkman's friendship has been strained since then - which might account for why Adam Strange hadn't appeared in any Hawkman adventures since World's Finest. This is just my speculation, however. "I hate to put it quite this way, but I've been with B&B for twenty years now. Twenty years. 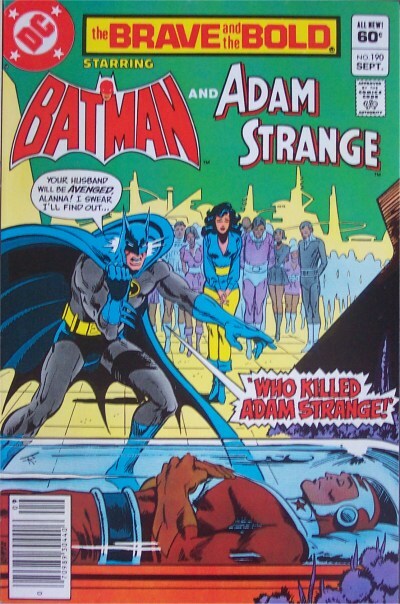 And I must say that, in all that time, there was never as bad a story as 'Who Killed Adam Strange?'." "Come on. A bad story isn't something to shoot for, but a great idea turned into a bad story is a crime. Think next time you, Mr. Barr, write a mystery and, Mr. Giordano, edit one. I haven't been this let down by a comic in a long time, and I doubt seriously that I have ever seen another that so much deserved never to have seen the light of day." 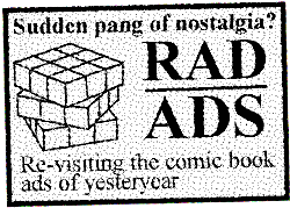 What's kind of ironic here is that Mike W. Barr would go on to write The Maze Agency for Comico in 1988 - a mystery comic series that would be nominated for an Eisner Award that same year. Clearly Barr knows how to write mystery. BatB would conclude 9 issues later at issue #200 [are you seeing a pattern here?] and would be replaced on the spinner racks by Batman and the Outsiders (also written by Barr). DC Comics Presents #82 (1985) has Adam Strange teaming up with Superman, again. Written by Cary Bates, if you need one good reason to check out this comic book... it's for the gorgeous Klaus Janson art. 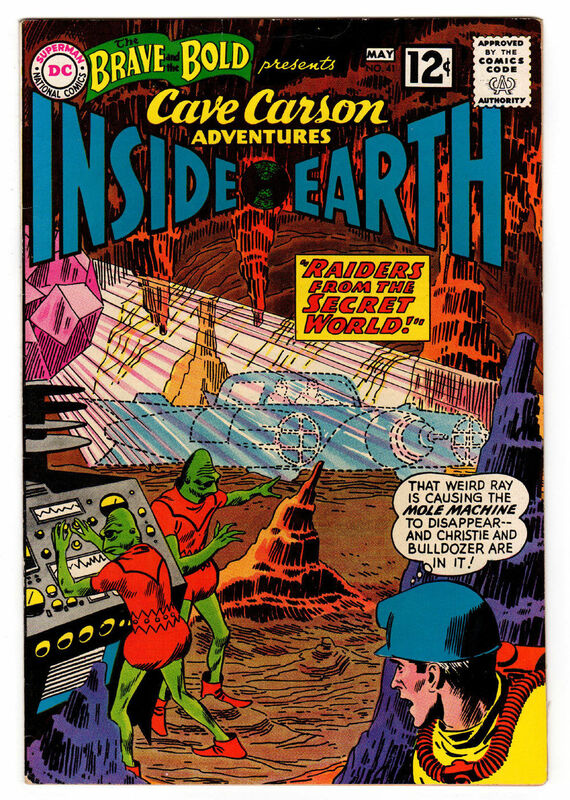 It's a self-contained story about an ancient mystical Kryptonian villain attacking Rann, and should probably be recognized as the end of an era as Julius Schwartz was the editor for this issue and pretty soon Superman would get Byrne-d and lose all of those cool Kryptonian legacy gimmicks that made him so fun to read in the Silver Age. 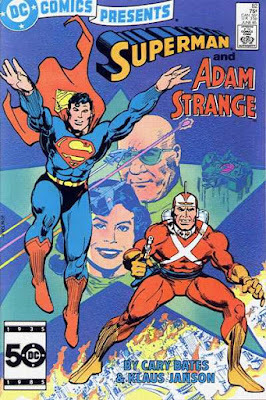 Bates gave equal attention to Adam Strange and Superman in this issue, so it was a nice introduction to the character for any readers unfamiliar with him. If you've made it this far, congratulations. You must really care about the comings and goings of Adam Strange in the 80s, or are reading with a mild interest to see if I'm going to mention the Alan Moore revision. Well, your waiting has finally paid off. Full disclosure: I am a major Alan Moore fan. I don't worship the ground he walks on by any means, but I feel that a lot of what he's written for comics is brilliant and influential. That being said, it is with a lack of personal bias that I tell you that the two-issue Adam Strange story in Swamp Thing v2 #57 - 58 (1987) is *the most important* Adam Strange story of the 1980s. This is Adam's first post-Crisis appearance and the story begins by taking a look at one of the less glamour aspects of Adam Strange's life - namely, chasing down Zeta-Beams to get back to Rann to be with his hot wife. and the fact that Adam is aware of the general population's feelings towards him. 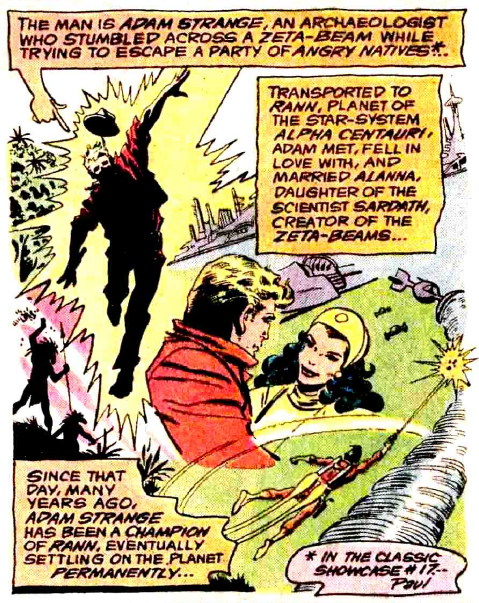 Adam Strange was originally Zeta-Beamed by Rann to help re-populate the planet (starting with impregnating Alanna). The Rann/Thanagar tension is alluded to, but the Rann/Thanagar War from Showcase is not acknowledged. [Perhaps it never happened as a result of Crisis on Infinite Earths?] Swamp Thing v2 #58 ends with an implication that the Thanagarians are plotting to invade earth. Readers had pointed out that the sinister motives of the Thanagarians in these issues kept in line with the Thanagarians depicted in 1985's The Shadow War of Hawkman mini-series. This two-issue Swamp Thing/Adam Strange story arc concludes with the announcement that Alanna is pregnant with (presumably) Adam's child - thus ending Rann's infertility streak. "The new approach to Adam Strange and Rann was actually the combination of Alan's talents and those of the writer of a new Adam Strange mini-series due to be released about a year from now, Donald. Alan was always planning to include a "Strange" adventure in Swampy's space odyssey stories, and when he heard of the character's new direction, he very graciously incorporated and established a number of the elements and events of the upcoming series (not to mention creating a solid batch of "Strange" concepts of his own as well)." 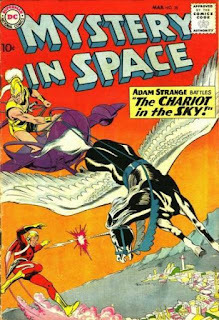 Berger didn't want to name the writer of the proposed Adam Strange mini-series, but it's a pretty good bet that she was referring to Richard Bruning and the Adam Strange: Man of Two Worlds three-issue limited series published in 1990. 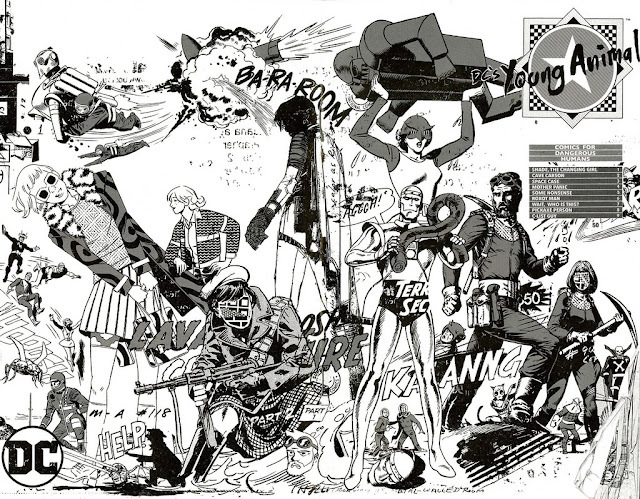 Adam Strange next appears in 1988's Cosmic Odyssey - a four issue prestige-format limited series that gathered a few of DC's more popular characters (including the New Gods) to battle a cosmic threat. When Rann is being affected by an 'insanity plague', Starfire and Lightray arrive on the scene to assist. A promising team-up for Adam Strange, Starfire and Lightray is quickly 86ed when Adam is subdued early in the adventure and spends the majority of the issue KO'd. Ah well. Cosmic Odyssey is a beautiful book, penciled by Mike Mignola and inked by Carlos Garzon. 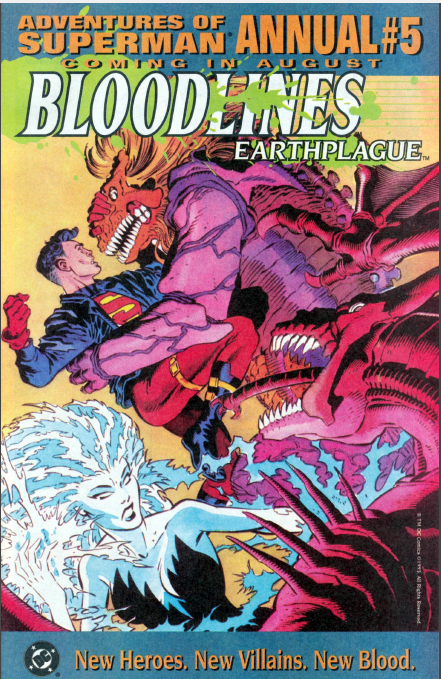 Written by Jim Starlin, this book included an all-star line-up of Batman, Superman, Starfire (of the Teen Titans), Green Lantern (John Stewart), Martian Manhunter, Doctor Fate, and Darkseid. Adam Strange getting to rub shoulders with these guys is a great introduction to the character for new readers. The big take-away here is that Rann is still acknowledged as an important facet of the DC cosmic universe (as is Hawkman's homeworld, Thanagar). Adam Strange and Rann are still very much a part of the DCU, which bodes well for the future of the character. Adam Strange appears in 1988's Invasion! cross-over event as he decides to 'take one for the team' and surrenders himself to the invading Alliance forces to keep Rann from being attacked. In keeping with the previously-established continuity, Adam's soon-to-be born child is mentioned by Alanna before he voluntarily surrenders himself. As a prisoner, Adam 'spies' on the Alliance forces and notifies earth. He manages to escape his captors, but gets re-captured and is ultimately saved by Firestorm, Power Girl, Firehawk and Starman. His misadventures on Starlag (location where the Alliance is holding it's prisoners) indirectly causes the L.E.G.I.O.N. to form. You may not quickly identify Adam in this Keith Giffen-penned epic, as he spends the majority of his appearances in Invasion! #1, Firestorm v1 #80, Starman v1 #5 and Invasion! #2 out of his traditional red 'space cadet' costume and in a blue prison uniform. Of note, Adam appears one final time in 1989 to say something soothing to Abby Arcane as she deals with the death of a loved one in Swamp Thing v2 #84. This appearance directly references his appearance in Swamp Thing v2 #61 (1987) in which he tried to deliver a message to Abby on behalf of the 'lost in space' Swamp Thing. 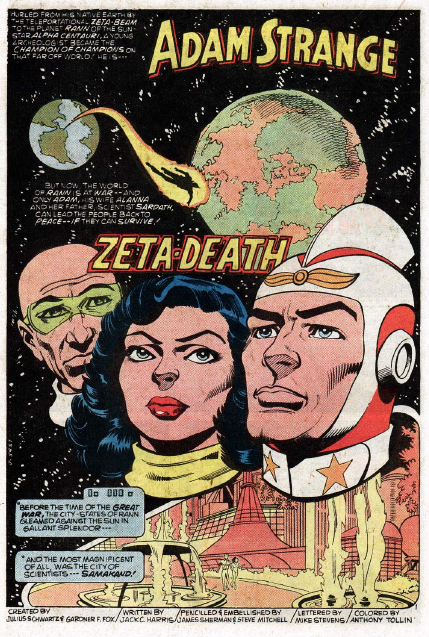 ...and this concludes our article on Adam Strange's major appearances in the 1980s. 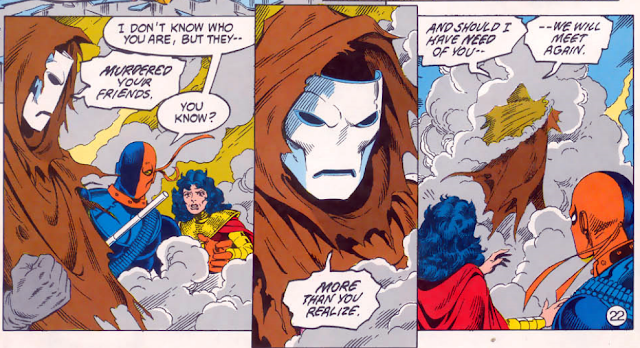 The transition of Adam Strange from altruistic space cadet to the dark reluctant hero of Rann is slowly starting to unfold and we'll be seeing more of this in the early 90s. I'm sure we'll get around to covering his early 90s appearances (including his 3-issue mini-series) at some point in the near future. Rip Dagger's Dojo: Silver Age JLA - Adam Strange! 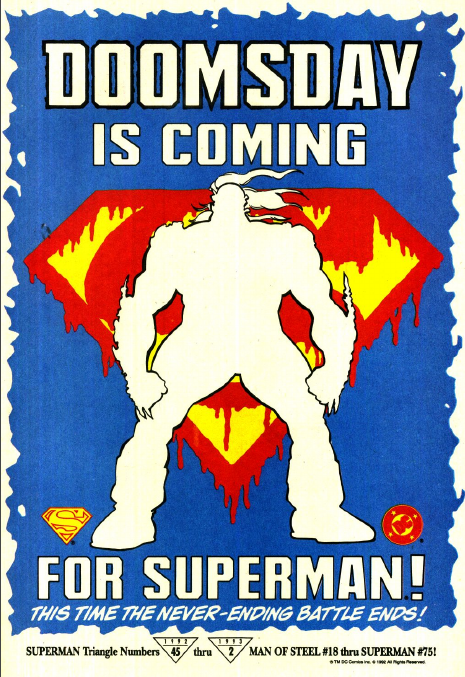 A gallery of house ads from the Reign of the Supermen! 1992's The Death of Superman was a HUGE event for me. 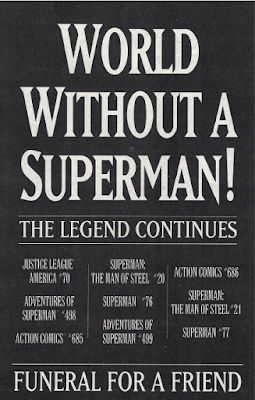 Not due to all of the media hype (and yes, it *was* being hyped by the media), but because I thought this was really it: DC comics was really killing off Clark Kent/Superman as we knew it. I was one of those kids that didn't really like Superman. I found him too powerful and on the verge of being God-like - hence, not very interesting to read about. (It doesn't help that, up to that point, I wasn't reading Superman in chronological order and couldn't distinguish between his 'Schwartz era', his 'Byrne era', his Salkind films or his cartoon versions. To me, it was all the same Superman: just a powerful guy who can conquer ANY foe.) 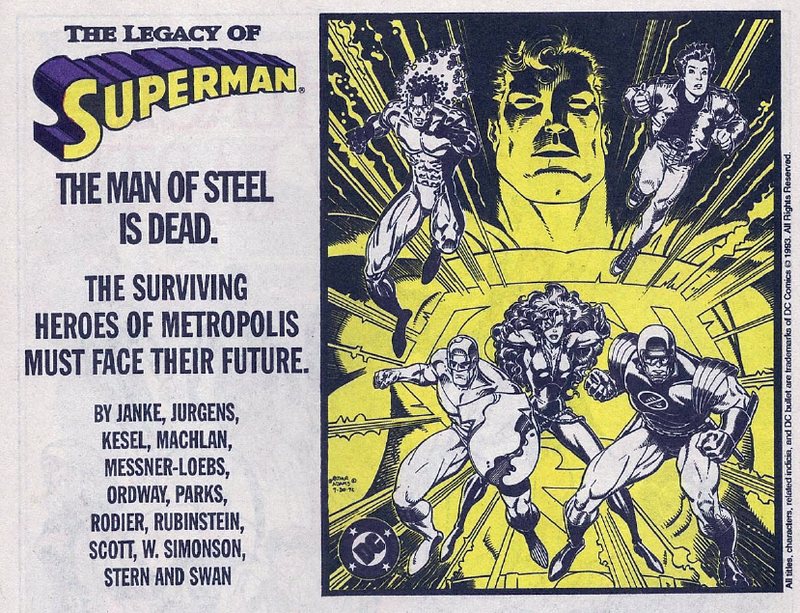 Either way, for this avid comic book collector/reader of the mid-to-late 80s, the Death of Superman was an epic moment that demonstrated that DC was willing to do bold things and was nothing like the company we had known from the previous decade. 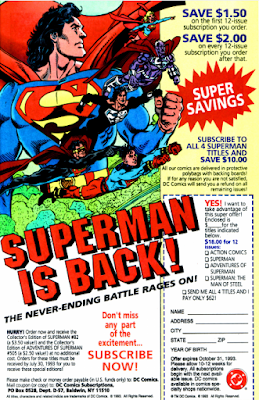 The Death of Superman house ads happened so quickly that if you weren't collecting/reading DC comics during the months of November '92 to February '93, then you probably missed them. 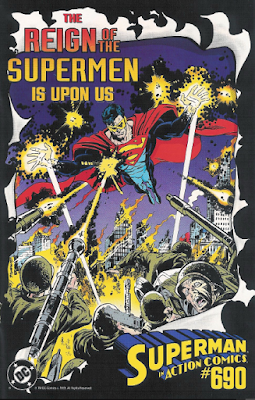 The entire 'Death of' event only occurred in the span of seven issues: Superman: The Man of Steel #18, Justice League of America #69, Superman #74, Adventures of Superman #497, Action Comics #684, Superman: Man of Steel #19 and, finally, Superman #75. [The event started and concluded within a span of 2 months.] Not much of a build-up or forewarning to get excited about it. 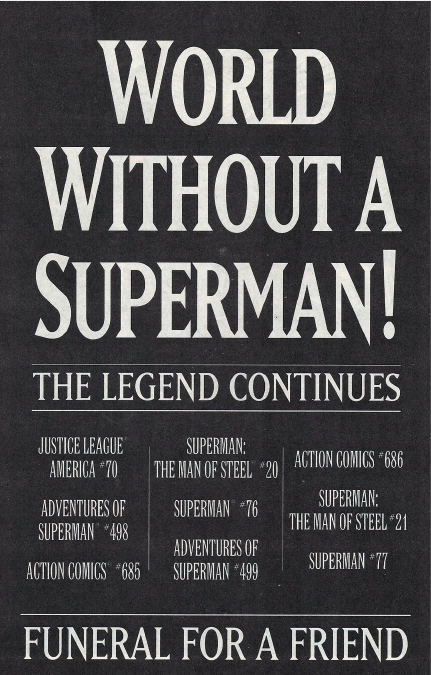 I really paid no attention to this 'publicity stunt' until it was announced on TV and radio that Superman had been killed, and speculators were lining up around the block to purchase Superman #75 from their local comic book shop. After Superman was killed, however, DC really wanted you to know he was gone. 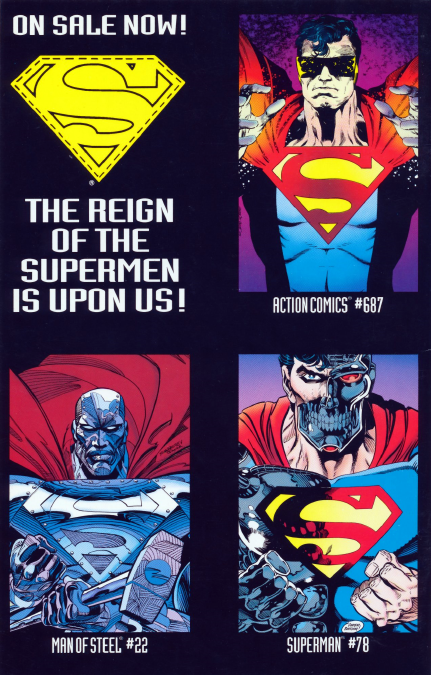 The DC marketing campaign didn't miss a beat, and made sure to advertise the SkyBox Death of Superman trading card set by offering a promo card in Superman #75. Next came Funeral For A Friend. I didn't really have a problem with a few of Metropolis' heroes picking up the slack. 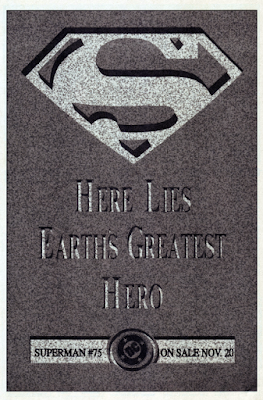 In my mind, that just cemented the idea that Superman was dead and wouldn't be coming back. [I mean, they did kill off Supergirl back in Crisis on Infinite Earths, and she stayed dead.] I still wasn't buying or reading any of the issues, but it was nice to know that DC was giving it's readers a sense of closure, and we can all now move on in a DCU without a Superman. 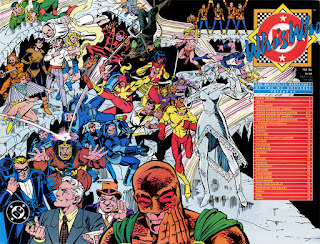 Pictured in the house ad above are Waverider, the Guardian, Thorn, Gangbuster and... Iron Munroe? I really have no clue who that flying teen in the leather jacket is. As mentioned, my interest in Superman at this time was at an all-time low. 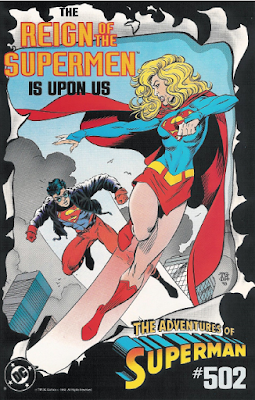 The big shake-up occurred with Adventures of Superman #500. 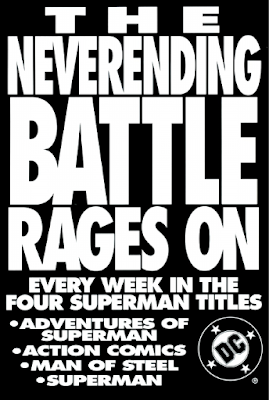 In my mind's eye, I guess I wondered why these four Superman titles [i.e., Adventures of Superman, Superman: Man of Steel, Action Comics, and Superman v2] hadn't ceased publication yet (or at least been re-titled to something else). The last 2 months of these issues had simply been Funeral For A Friend stories and I was a little eager to see this all resolved. This had been started to feel like the longest denouement ever, but Adventures of... #500 resolved with a cliff-hanger. By the end of the issue, four brand-new characters had appeared claiming to be [the reincarnated spirit of] Superman - and this had me hooked. 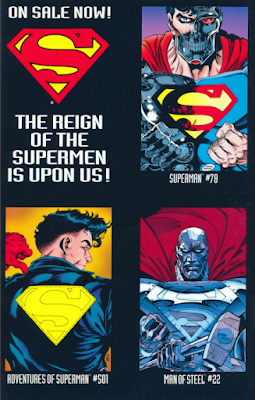 As a lover of DC comics and mysteries, The Reign of the Superman! had a lot of story-telling elements that kept me coming back for more. I was absolutely convinced that the Last Son of Krypton/Eradicator was the true Superman. 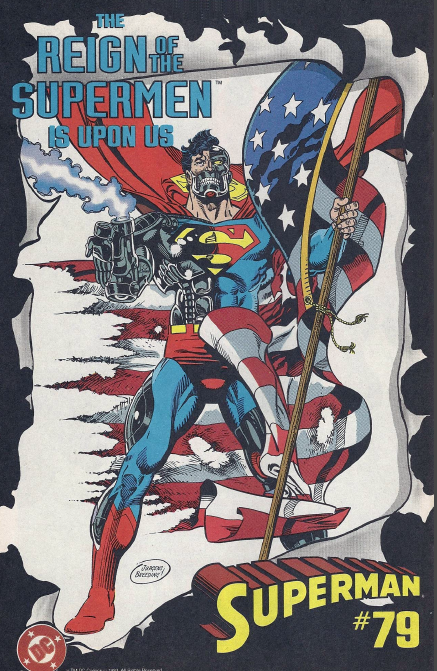 The Man of Tomorrow/Cyborg Superman was a close second [Terminator 2: Judgement Day was still on everyone's collective minds, and we all imagined how cool it would be if Superman's new 'look' included half of a T-800 exoskeleton]. I had reasoned that there was NO POSSIBLE WAY that neither The Metropolis Kid/Superboy nor The Man of Steel/Steel were the real deal (for obvious reasons). I was so sure about the Eradicator that I would've bet money. As the narrative of the house ads unfolded, it was revealed that each of the four prospective Supermen would encounter each other and square off with other Superman-related characters in the DCU. Guy Gardner versus the Eradicator was just a bonus. The home stretch of the Reign of the Supermen! story line (also known as The Return of Superman) crushed my hopes and dreams as it revealed that the original Clark Kent/Superman had returned, and that all four of these candidates were simply usurpers to the 'Superman' name. 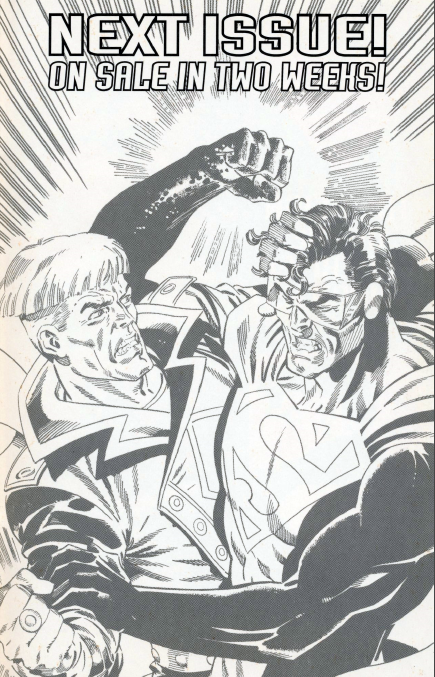 I once had a chance to chat with Tom Grummett, who pencilled quite a few issues during the Reign of the Supermen! 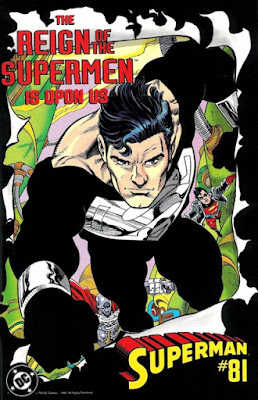 story line and was part of the Death and Return of Superman planning team, and he laughed at my once-youthful naivety and assured me that there was never any doubt in anyone's mind that Clark Kent/Superman would be returning to his own title. Clark Kent/Superman retained his original four titles. 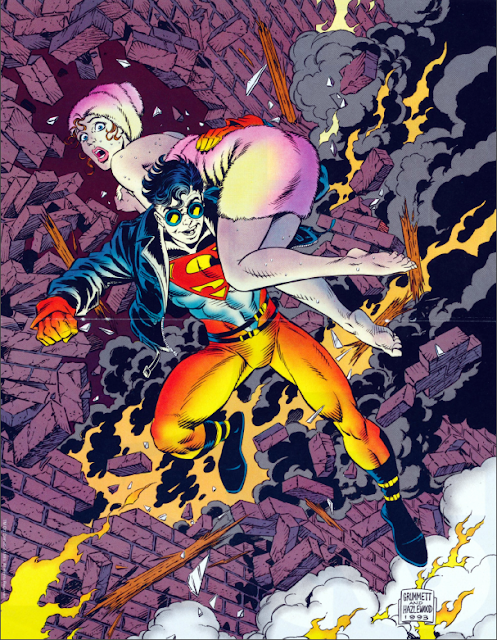 Superboy received an ongoing series that would last well into 2002, Steel also received an ongoing series that lasted an impressive fifty-two issues, and Supergirl received a four issue mini-series (she stayed pretty active in the DCU after that and later joined the Teen Titans in 1995). 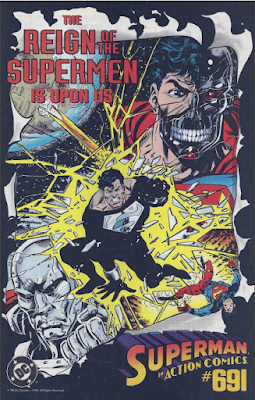 The Eradicator, for some unprecedented reason, ends up joining the Outsiders in 1994, and Cyborg Superman would remain a villain and pester Superman for years to come. You also might be interested in reading Chris Sheehan's review of the Death of Superman storyline. Chris gives a play-by-play analysis of the issues leading up to Superman's death on his Chris is on Infinite Earths blog.